Prince George on his 3rd birthday. The adorable tot is pictured here with the family dog, Lupo. We already know that this is the most popular dog breed in Britain (surprised?) and that this is the most popular pet name. If you have a dog, you’ll know that it’s so much more than the most heart-bursting delfies and snoozy Sunday snuggles – there’s also evidence to suggest that having a dog is good for your health, so if your New Years resolution was to fill up your house with approximately 23 fur babies, you’ve got science basically giving you the go ahead. Plus, research also confirmed that we love dogs more than we like other humans, and we already knew it. It’s hardly surprising, then, that the royal family are a dog-centric unit. All members have pooches of their own, from the Queen’s well-known love of corgis to Meghan Markle’s beagle and Labrador. Since 2012, Prince William and Kate Middleton have had a family dog of their own, an English Cocker Spaniel named Lupo. He was born to a litter from Kate’s family dog, which makes him pretty special, but there’s also a very sweet reason behind their decision to take on a furry family member. 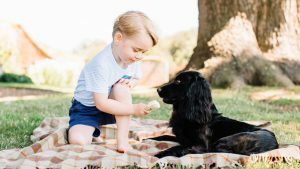 In December, William and Kate held a party for RAF families, and one guest, Natalie Bressani, spoke to the couple about their pet. Kate reportedly admitted that they decided to get a dog to keep her company while William was away in the Falkland Islands. At the event, Kate opened up about how difficult it can be when your significant other works away from home. The post Kate and William got their dog for the sweetest reason appeared first on Marie Claire.